42 of 42 people found the following review helpful. So nice to have the two plugs in front rotate, I just wish the one on the back did. If I use it on the wall outlet, I can't use the other plug, because the unit is just a touch too big. The back plug is directly under the USB ports and the unit hangs to the right side....so if anything is in your way on the right side of the outlet this won't work (my outlet has a light switch on the right side and a surge protector reset switch--this gets in the way of both). Good quality and so nice to be able to plug in USB cables. It just needs that one rotating plug to be five stars. 60 of 63 people found the following review helpful. Very nice, but mine burned. I liked how the unit worked and it was exactly what I needed. I would have rated it 5, and I know it's an anomaly, but I had to rate it 1 because of a malfunction. My unit had been plugged in for a few days. I usually use it to charge my devices. It hadn't been used in a couple of days, and it was just lucky that I found it. It had always run a little warm, even when idle, but when I removed the unit from the wall and it was hot. It had burnt through the back. It didn't cause any damage, but it would probably caused our house to burn had it ignited. That is the worst case scenario, I admit. Now I want to find another unit just like it, but different. Bummer. I received my 360 Electrical 36053 from my favorite store - Amazon. Based on my use this far I declare it "mostly good". -It's a nice size for a two outlet + USB surge protector (fairly compact). -The build quality is good - appears durable. -The swiveling plugs are very handy to accommodate bulky adapters. -The USB power is not wimpy. I've been trying to upgrade my wimpiest 1 Amp USB chargers since alot of phones/tablets (even my HP Chromebook) these days are able to charge faster with more Amps - from the info provided on the 360 product I wasn't totally clear on it's Amp output capabilities for single device (ie, is that 1 Amp per outlet or more?). 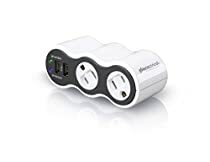 What I've since found is this surge outlet has 2 USB's but it appears if you use just one USB at a time it gives you full 2.1 Amp output but if you use both USB at the same time your Amps output will be less. Per the 360 instruction book "USB ports typically share power output..small devices require less...large devices require more". -Like alot of other surge protectors I've used the power lights (two of them) can be annoying if you have this plugged in a place where that might bother you (eg, bedroom, anywhere else where visually distracting). Would be nice if this feature included an off switch...in the meantime a tailored piece of black masking tape does the trick to cover up the lights. -This surge protector plugs in and then extends to the right side at a right angle and does not give you an option to swivel that position. In my case I had a door jam on the right side that was too close to the outlet and prevented me from using it in that spot. Overall, a nice product with a few things that could be better. At $18 price, 4-stars from me in consideration of price/value.